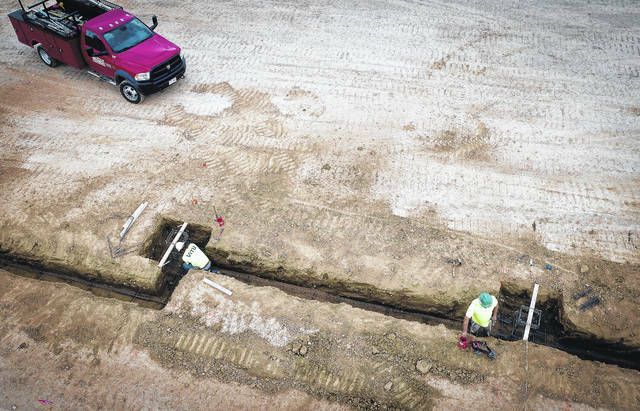 The land has been cleared and excavation for the foundation has begun on the new Buckeye Valley West Elementary School on State Route 257 at Bellpoint. Construction workers are placing concrete forms into the excavated line of the building’s foundation. Photo Courtesy | Ruscilli Construction Inc.
Construction began a few weeks ago on the new Buckeye Valley West Elementary building on State Route 257 in Bellpoint. As of end of business Friday, the land had been cleared and the excavation for the foundation had been started. The school district asked voters to pass a $31.25 million bond issue in November of 2015 for the construction of two new elementary buildings. The issue passed by two votes once a recount was conducted by the Delaware County Board of Elections. The projected cost for BV West is $13.6 million and it is designed to serve 625 students. The school district purchased the 39 acres of land along State Route 257 just north of Bellpoint in Concord Township for $535,000 in the spring of 2016. Miller said the plans for the BV West building are more complex than any of the other district buildings which has made the permitting process more difficult. He said a large part of the delay was because the building has an on-site sanitary plant and an additional turn lane will be added to State Route 257. The projected cost for BV East in Ashley is $11.6 million, which is designed to serve 475 students. The old building is being renovated and will incorporated into the new building. Renovation began on the BV East building started at the beginning of the summer. Miller said when the first phase of construction is completed, students will transition to the new section allowing construction to start on the remaining portion of the building. According to Miller, the district’s goal is to have both elementary buildings completed in time for the 2018-2019 school year. https://www.delgazette.com/wp-content/uploads/sites/40/2017/10/web1_DJI_0007_1.jpgThe land has been cleared and excavation for the foundation has begun on the new Buckeye Valley West Elementary School on State Route 257 at Bellpoint. Construction workers are placing concrete forms into the excavated line of the building’s foundation. Photo Courtesy | Ruscilli Construction Inc. This entry was tagged Buckeye Valley, BV West, construction. Bookmark the permalink.